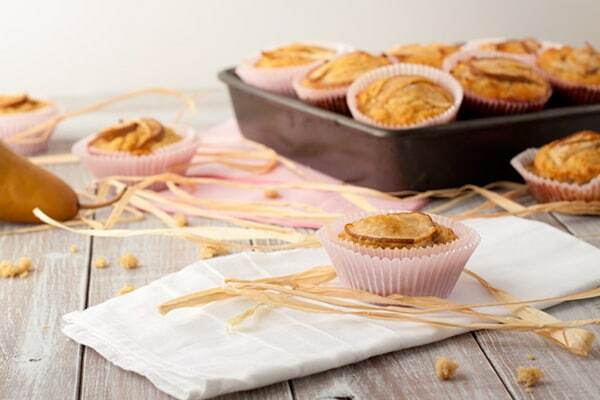 Enjoy learning more about Leanne and her Vanilla Pear Muffins and see the whole line-up of bloggers, blogs, and muffin recipes here. Leanne’s a holistic nutritionist who helps “real people from around the world with real advice.” Her popular blog, Healthful Pursuit, is a unique collection of motivational guidance and easy-to-make recipes for women who want to create a liberated life on a restricted diet. Honestly, I’ve been reading raves about Leanne, her blog, her recipes, cookbooks, and much more for years. Finally a few months ago we were connected through a mutual friend, who is another star in the gluten-free community, Kelly of The Spunky Coconut. Now we’re making up for lost time and I will tell you that Leanne is just as terrific as everyone says she is! 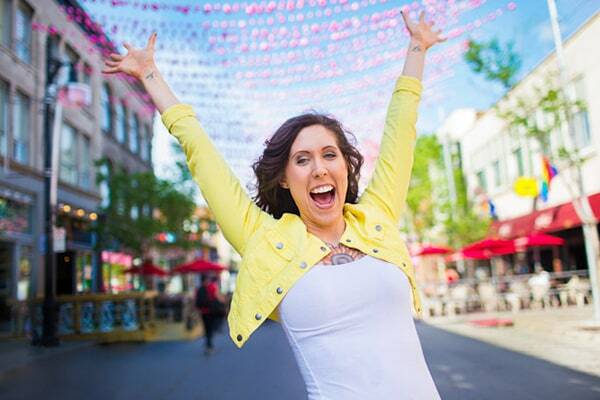 The photo below shows the real Leanne—all smiles, super positive, and just full of a zest for life! I’ll turn it over to Leanne right now, so she can tell you more about her blog and services and then get to the all-important muffins recipe of the day! If you’re ready to create the life you’ve been dying to live by liberating your eating style and join a community of thousands of women on the same path, head on over to HealthfulPursuit.com. Be sure to check out Leanne’s new cookbook, The Keto Diet: The Complete Guide to a High-Fat Diet, with More Than 125 Delectable Recipes and 5 Meal Plans to Shed Weight, Heal Your Body, and Regain Confidence. It’s an Amazon bestseller! On Leanne’s site, you’ll also find meal plans, podcasts, videos, and more recipes (of course). Muffins are king around our house. They’re portable dollops of goodness that I pack full of good things that my fiance and our family will eat without batting an eye. Add ground flax seed for a dose of healthy fats, protein powder to amp up your protein intake, extra fruit if you find it challenging to get all the fruits into your day, double up on the nuts for added fiber… there are so many ways to make them work for you. My perfect muffin is something that’s high in protein, light, low in calories, and high in fiber. Sound like too much to ask for? No way. 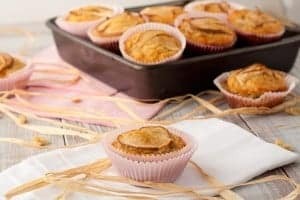 Enter the gluten-free vanilla pear muffins that are solving our snacking problems one low calorie, high fiber bite at a time! These Vanilla Pear Muffins are 150 calorie grain-free muffins made with coconut flour, lemon zest, vanilla and fresh pears. Perfect for traveling, lunches, or a sweet afternoon snack. Preheat oven to 400F and line 6 muffin tins with muffin cups. Set aside. Place wet ingredients in a medium-sized mixing bowl and mix well with a hand mixer. In a small bowl, combine coconut flour with baking powder and nutmeg. Drop into the wet ingredients and mix until there are no lumps. Drop batter into muffin cups and place sliced pears on top with a sprinkle of coconut sugar. Bake in preheated oven for 16-18 minutes. Allergen info: Gluten-free, Dairy-free, Refined sugar-free, Yeast-free, Corn-free, Grain-free, Nut-freeMuffins can be stored for a few days at room temperature. Keep in the fridge to prolong time, or freeze in an air-tight container for up to 3 months. Originally published March 18, 2014; updated July 16, 2017. These look beautiful. Now I’m wondering about putting pear in a muffin, too! Do it! It adds so much awesome flavor, a little sprinkle of sugar is great, too! I have tried 6 of the muffins this month. This is next! I’m going to have to try these — I love pears! These muffins remind me of a wonderful pear variety called the Concorde pear. It tasted like a sweet pear with strong overtones of vanilla. I don’t know if it’s still around, but we generally had to go to farm stands about 2 hours away from home! So now I add vanilla to my pear dishes to recapture that taste. These muffins sound delicious! Vanilla and pear, great combo! Would like to try these without the pears. Ooh, these sound really good and since I have all the ingredients on hand, I’m hoping I can find the time to make these later today. I love recipes that aren’t loaded with sugar, too. Awesome! Leanne never ceases to amaze me with her creativity and delicious food! and love the Blendtec – that is my dream for years. Ooh these sound great! I love pears & combined with vanilla, they just sound heavenly! Pears are so often overlooked and so delicious. Thanks for thinking outside of the usual muffin ideas! Love Leanne’s recipes and the fact that they are so well identified as to what may be a problem area for you and how she has avoided that. WOW – thanks for the recipe! These look wonderful. Going to get some pears tomorrow so I can make them! I love pears, will have to try this recipe! I’m not sure if it will work in the muffins as xylitol is a granulated sugar and honey is not. If you try, let me know! There is definitely a dry ingredient missing – I have this in the dish ready to bake and this consistency just does not look right – help! Hi Rinette–Unfortunately I don’t have a definite answer for you. Hopefully, Leanne will be able to respond soon. Have you baked with coconut flour before? It’s very absorbent so the “problem” might have resolved itself while you’ve been waiting for an answer. Just guessing here, but it’s very possible that’s the issue. Being a bit of in inexperienced “baker” I attempted this using Red Mill Gluten Free flour …. that’s probably it 🙂 thanks for the feedback. Rinette–You’re welcome, of course. Having that additional info from you, yes, that is definitely the problem. Coconut flour is very different from any other gf flour. You CAN’T just substitute it for other gf flours and vice versa. Sorry. And personally I don’t use Bob’s Red Mill gluten-free flour at all for so many reasons, with the flours used in the mix being one of them. I don’t care for bean flours. You will never get a light and tender muffin using BRM gf flour. Just FYI, since you’re new to gf baking, you can’t simply sub one gf flour for another in a recipe. GF recipes are created using specific flours. Yep, that’s a critical difference! Multitasking will get a girl every time. 🙁 Aaargh. Updated my comment. Thank you! Wow. it looks like another good muffin recipe to try. These sound like they would be delicious! perfect timing–I was just trying to figure out how to use coconut flour!! I’ll double the recipe, and try it this week. Hi Leanne, I love this recipe because I can’t have any grains or sugar. I can easily sub stevia for the sweeteners. Plus they will be quick and easy as well as delicious! Kudos! Yum!! Always looking for muffin recipes that will work with my paleo diet (I have Hashimoto’s disease). I am NOT a morning person so muffins are wonderful to make the night before. GRAIN-FREE LOVIN’ OVER HERE!!! Can’t wait to try these and all her fabulous cookbooks as well! They look fantastic, but is there really only 1/4 cup of coconut flour? Hard to believe it holds together. 🙂 I’m going try them for brunch tomorrow! Hi Jill–It’s good to see you here again! 🙂 Yes, that is the correct amount. Coconut flour is pretty unique in its “absorbency” abilities. I often add just a tablespoon or a sprinkle when a recipe ends up having too much liquid. It’s kind of a magical ingredient in my opinion. 😉 Did you give this recipe a try? These look delicious! What an interesting idea. Yum! I love pears. I can’t wait to try these! Hi, what can I use instead of coconut flour? Can it be substituted with Almond meal/flour? Thanks. Hi Tracey–I’m going to step in for Leanne. Coconut flour is a very different ingredient. As I was just replying to another reader, it can’t be substituted for other flours one to one or vice versa. Most recipes with coconut flour use a lot of liquid (in many recipes, eggs are that liquid). If you wish to use almond flour, it’s best to go with a recipe that has been developed for almond flour. There are quite a few of those in this event. You can see them all here. If you’re looking for an almond flour-based pear muffin recipe, you might use a basic almond flour muffin recipe and simply add Leanne’s pear topping. Let us know if you come up with an alternative recipe! 🙂 Thanks. Thanks Shirley. I appreciate your reply. I’m going to make these to take to work for treat day! Wow, do these ever look delish! I am allergic to coconut. Would almond flour be a good substitue? These muffins sound fantastic. Thanks for sharing. Yet another muffin to pin and try! I love that they are grain free! I actually have the ingredients for these. My girlfriend and I are hoping to get together and make a few of the muffins you’ve posted. I am eagerly anticipating trying these! Vanilla and pear sounds like a great combination! I like that there are not too many ingredients or ingredients I don’t regularly use. What a good looking pear muffin. Can’t wait to try. These are seriously good. I made them in a mini-muffin (silicon) tin. I decreased the baking temperature to 180 C and baked for 20 minutes. Delicious! I love pears, and since my pear cake resipe didn’t turn out as I wanted, I am going to try this one. At least they look yummy. I don’t believe I’ve used pears in muffins before but I imagine it’s very good. My family loves muffins but we’ve never had a pear muffin before. Thanks for the recipe! Pear desserts are where it’s at. And can’t wait to check out the cookbooks mentioned too! I’ve never thought of using pears for a muffin. I made biscuits with them before, so I bet these are just heavenly. Yum! Would have never thought to use pears in a muffin recipe. Cool idea! Will have to try this recipe in the summer, I haven’t seen pears in the store in months! Thank you for the yummy recipe!